Dim Sum "Of The Heart"
In business, we're taught to always have a "Plan B," but I'd add that it's wise to make sure that the alternative is as good or better than the original. In other words, when you're dealt lemons, don't just make lemonade — make a lemon daiquiri! One recent afternoon, I invited a group of music producers and audio teachers from The Art Institute of Fort Lauderdale for lunch at a west Broward Japanese-Thai-Vietnamese emporium, but when I arrived early, it was closed! Fortunately, Toa Toa, one of South Florida's very best Chinese restaurants, was nearby and for our group, the substitution turned out to be fortuitous. 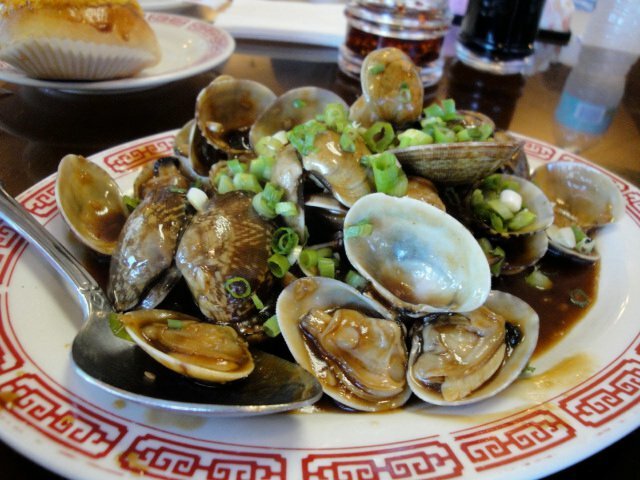 Situated in a cool corner of an expansive shopping center in Sunrise, Toa Toa is a reliable purveyor of Cantonese, Mandarin, Hunan and Szechwan favorites. It also excels in the popular dishes customized for American palates such as chicken chow mein, shrimp with lobster sauce, beef lo mein and the like. But the best thing about Toa Toa is its delightful dim sum. 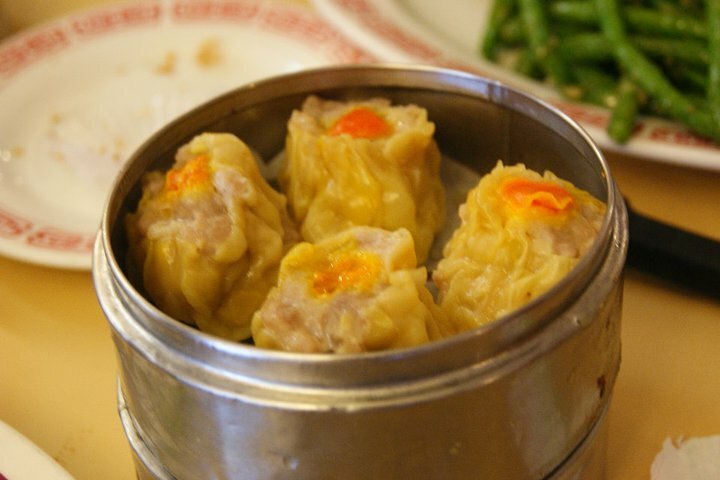 Dim sum, which means "of the heart," originated in Canton's tea houses. Each order consists of a single, small portion of steamed or fried dumplings, buns, stuffed vegetables, noodles, meats, fish, or steaming bowls of soup with noodles, shrimp, fish, meat, and vegetables. A meal consists of an array of these small plates, usually shared among several people, family-style. For business lunches, a meal of dim sum at Toa Toa is a powerful catalyst for instant conviviality. You might not want to invite a stuffy, uptight client or boss for lunch here, unless, of course, they are predisposed toward lightening up a bit or you know they love Chinese cuisine. But its scrumptious little plates, efficient service and reasonable prices make Toa Toa the ideal spot for a friendly repast, for business or pleasure. Plus, the variety and staggered arrival of each dish provides convenient pauses for lively conversation. Our group of eight was seated after a very short wait. The server handed us a slender paper menu listing each of the available items in English and Chinese. A "regular" menu was also included, as was a laminated pictorial guide to the dim sum dishes, along with a pencil. I wrote the desired number of portions of each item on the menu and handed it back to the server after announcing the choices our group would share to my assenting guests. 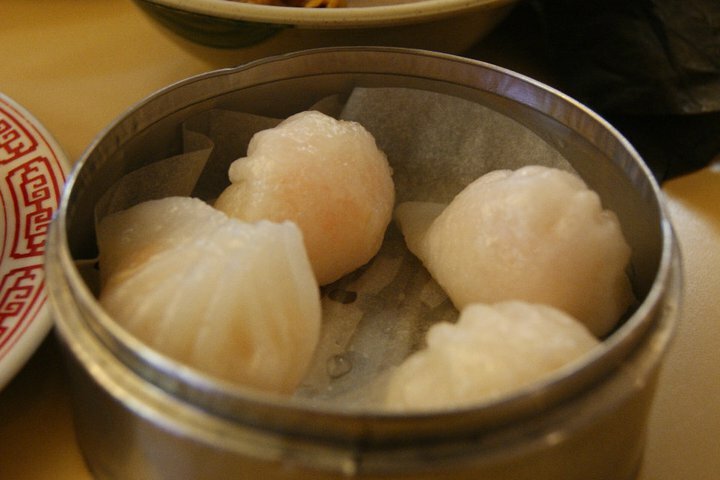 Shrimp dumplings are usually a favorite, so four orders of the four-dumpling dish were requested. We also ordered multiple portions of siu mei (wonton skins filled with a pork and shrimp mixture); stuffed eggplant; beef rice paste (a flat rice dumpling filled with chopped and seasoned beef); steamed pork and chicken dumplings (which had an airy pastry-like texture); fried crab claws and silver noodles, which resembled malformed bean sprout shafts combined with strips of scrambled egg, shrimp and roast pork. Yum! Each dish arrived at our table hot from the kitchen. First up were the shrimp dumplings. A splash of soy sauce and a drizzle of (spicy) chili oil gave them an extra kick. Audio engineer Ed Mashal, one of my guests (check the credits of your copy of the Eagles album "Hotel California"), declared that it was "fantastic!" He doesn't eat meat, so he passed on the siu mei, which appeared shortly thereafter, but Russ Ben-Ezzer and Brian Campbell, partners of StepBrother Productions (www.stepbro.com), devoured them with gusto — and chili oil. Ray Dawson of Deerfield's Zero Digital noted that "the prices here are amazing." Indeed. They ranged from $2.45 for the shrimp dumplings to $5.95 for the silver noodles (take-out and dinner prices are slightly higher). The eight of us stuffed ourselves for under $80 plus tip. True, if we'd ordered drinks, the tab would have increased, but the hot tea was the ideal accompaniment for the steamed and fried dishes. Rating: Terrific food — and the price is more than right. Details: Located in an outdoor shopping center with ample parking. Address: 4145 NW 88th Ave., Sunrise (Pine Plaza). 954-746-8833. Type of food: Mandarin, Hunan, Szechwan and Cantonese favorites, especially dim sum. Average prices: Approximately $10 per person for lots of small plates and hot tea. Service: Friendly, helpful and non-intrusive. Atmosphere: Broward neighborhood, family Chinese. Best for: Inducing or reinforcing instant conviviality and a spirit of sharing among business colleagues. Hours: Monday, Tuesday and Thursday: 11 a.m. to 10 p.m.; Friday and Saturday: 11 a.m. to 10:30 p.m.; Sunday: 10:30 a.m. to 10 p.m. Closed Wednesday. Reservations: Not necessary, but not a bad idea for larger parties.